› Author AffiliationsThis research was supported by the Institute for Basic Science (IBS-R010-D1) in Korea. A metal-free procedure for the hydrogenative reduction of substituted N-heteroaromatics has been developed by using hydrosilanes as reducing agents. The optimized conditions were successfully applied to the reactions of quinolines, quinoxalines, and quinoline N-oxides. They were also effective for the reduction of quinolines bearing amino or hydroxy groups, where H2 was evolved through dehydrogenative silylation of the amine or hydroxy moieties. 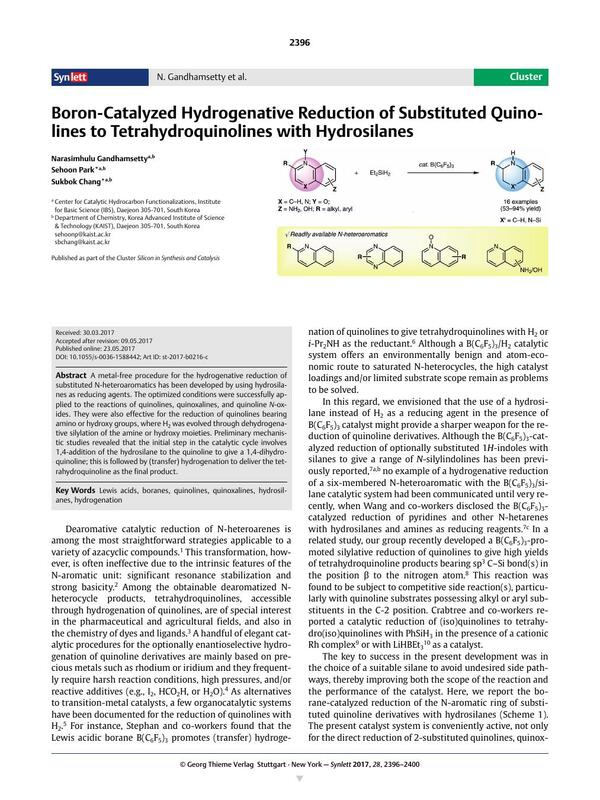 Preliminary mechanistic studies revealed that the initial step in the catalytic cycle involves 1,4-addition of the hydrosilane to the quinoline to give a 1,4-dihydroquinoline; this is followed by (transfer) hydrogenation to deliver the tetrahydroquinoline as the final product. Supporting information for this article is available online at https://doi.org/10.1055/s-0036-1588442. 11 2-Methyl-1,2,3,4-tetrahydroquinoline (2a);14 Typical Procedure In a 1.5 mL reaction vial, B(C6F5)3 (0.025 mmol, 5.0 mol%) was dissolved in CHCl3 (0.60 mL), and Et2SiH2 (1.75 mmol, 3.5 equiv) was added. To this catalyst solution was subsequently added 2-methylquinoline (1a; 0.50 mmol, 1.0 equiv). The mixture was stirred at 65 °C for 6 h, allowed to cool to r.t., and concentrated under reduced pressure to give a crude product. This was treated sequentially with 0.25 N ethereal HCl solution (7 mL) and sat. methanolic Na2CO3·H2O (1.0 mL) to neutralize the crude solution. Finally, the neutralized mixture was purified by column chromatography [silica gel, EtOAc–hexane (1:9)] to give a light-yellow liquid; yield: 56 mg (76%, 0.38 mmol). 1H NMR (600 MHz, CDCl3): δ = 7.03– 6.91 (m, 2 H), 6.62 (t, J = 7.4 Hz, 1 H), 6.48 (d, J = 8.3 Hz, 1 H), 3.68 (s, 1 H), 3.46 – 3.34 (m, 1 H), 2.91–2.79 (m, 1 H), 2.79–2.67 (m, 1 H), 2.00–1.84 (m, 1 H), 1.67–1.51 (m, 1 H), 1.22 (d, J = 6.3 Hz, 3 H). 13C NMR (150 MHz, CDCl3): δ = 144.7, 129.2, 126.6, 121.1, 116.9, 113.9, 47.1, 30.1, 26.6, 22.6. 13 Although we observed hydrogen evolution through dehydrogenative silylation at the C-6 position during the catalytic turnover, homocoupling of the hydrosilane15 giving rise to a disilane and H2 should also be considered as another minor pathway under borane catalysis.